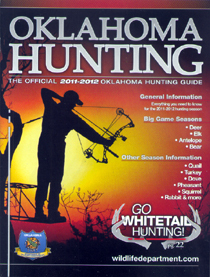 2011-2012 Hunting Guide Guide in PDF ( 64 pages, 10 MB) You will need to download the free software to use the pdf version. The pdf version may take a little bit longer to download. These are not a legal document. This is an interpretive summary of the Titles 29 and 800 of Oklahoma Statutes governing Fish and Wildlife laws as established by the Oklahoma Wildlife Conservation Commission and contains those rules that affect the average angler. For a complete listing of official regulations, you can obtain copies of current Oklahoma Statutes through your local library. The following are brief descriptions of regulation changes for the 2011-2012 season. This section is intended as a reference. However, you must still be familiar with all laws that apply to a particular season. Some new hunting license options are available, such as the fiscal-year license. Other hunting licenses have been restructured. See pages 10 and 18-19 for more information. A Southeast Region has been created for spring turkey hunting. The season will have a delayed start in this region, and will run from April 23, 2012 - May 6, 2012. The season limit will be one tom only. The Southeast Region includes Atoka, Choctaw, Coal, Latimer, Le Flore, McCurtain, Pittsburg and Pushmataha counties. See pages 30-31 for more information. The Southwest Zone for dove season has been eliminated. The entire state has the same season, which runs from Sept. 1 - Oct. 31, 2011 and Dec. 24, 2011 - Jan. 1, 2012. See page 34 for more information. On Aug. 26, 2011, the age of exemption from hunter education lowers to 31. 1. Hunters age 8 to 30 may purchase an apprentice-designated license. 2. The accompanying hunter age limit lowers to 18. On Aug. 26, 2011, all hunters under the age of 10, hunter-education certified or not, must be accompanied while hunting big game. Oklahoma is now a member of the Interstate Wildlife Violator Compact, which covers 33 states. A violation in any member state can result in the loss of hunting or fishing privileges in all the states. Several new laws have increased penalties for trespassing and altered trespass provisions. Visit www.wildlifedepartment.com/legislation.htm for complete information. This information is a summary of Titles 29 and 800 of the Oklahoma Statutes governing Fish and Wildlife laws as established by the Oklahoma Wildlife Conservation Commission and contains those rules that affect the average hunter. It is not a legal document. For a complete listing of official regulations, you can obtain copies of current Oklahoma Statutes through your local library.